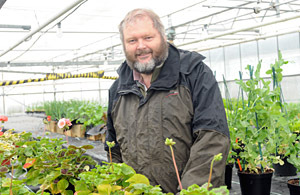 For horticulture lecturer Chris Bird, it’s a chance to take a budding new team of second year students to the show off their skills at the greatest flowers show on Earth – the RHS Chelsea Flower Show. A team of 10 students will be attending the show with him and Inside Hampshire met three of the team leaders. Jack Stanford is in charge of the landscaping, Hugo Fillery is heading up the plants, growing and maintenance team and Stephanie Jeffery is looking after the graphics team. There’s much excitement about the forthcoming show and the garden is well under way. Called ‘Space Race’, the garden is split into 6 zones with 4 different levels of interest. It is designed to reflect the need for making the most of small spaces because people these days can be quite limited on the amount of garden space that they have. For this reason the planting has been chosen carefully. “Each plant has to have at least three uses, such as aromatic, medicinal and culinary,” says Chris. The garden is great for wildlife. The shed roof will be planted with Thyme and bird boxes will sit underneath it. Stephanie has been looking into the sizes of apertures needed to attract different types of birds and tells us that the boxes will be ideal for small garden birds such as robins. As well as the structural and planting aspects, there is also the graphic to think about. Stephanie designed the logo and she explains that the sunflower reflects the planting, the cityscape reflects the environments where this type of garden is most likely to be found, and the butterfly reflects the wildlife aspect. In 2010, Sparsholt were the first to use touch screens as part of a garden and they will again be using this interactive and educational feature. Show visitors will be able to find out about the plants used in the garden at 4 different levels of detail. Another interesting feature of the garden is the use of a ziggurat bed for planting. This is a stepped raised bed. “It allows the planting of deep root crops such as carrots” says Chris. “It also allows flexibility because you can easily take a level out,” he adds. If the bed is set is on north-south orientation, the plants get an even amount of light to enable them to grow. Jack has been busy putting the frames together and also working on the build of the shed. In the greenhouses, Hugo has been paying close attention to the quality of the plants. Some have been held back in a darkened area to prevent them flowering too early, and others require careful weeding to remove stray grasses and other unwanted plants that have got into the pots. Only the best plants will be selected for transportation to Chelsea. The garden will also show off the horticultural skills of local growers. Some of the plants that can’t be grown at the college, such as the blueberries, will be sourced from local suppliers. Other college departments are also helping out such as the forestry department which has cut and planked the wood for the shed. When on site, the build is expected to take 5 and a half days and the team are hoping that their efforts are worthy of an RHS medal. 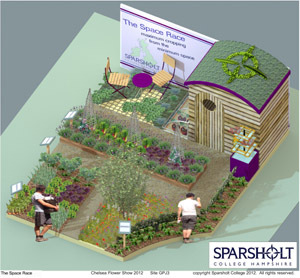 The Sparsholt College garden can be seen in the Great Pavillion (GPJ3) at the RHS Chelsea Flower Show from 22nd-26th May.